I am so excited to share this recipe! I was struggling to figure out what to make this week and then this idea popped into my head. Any chance I have to add Gouda is a win in my book and I have an addiction to Chorizo lately. Don’t fret though if you are not a fan of Chorizo feel free to add sausage, bacon, taco seasoned ground chicken or turkey or even diced ham. Directions: Pre-heat oven to 475 degrees. 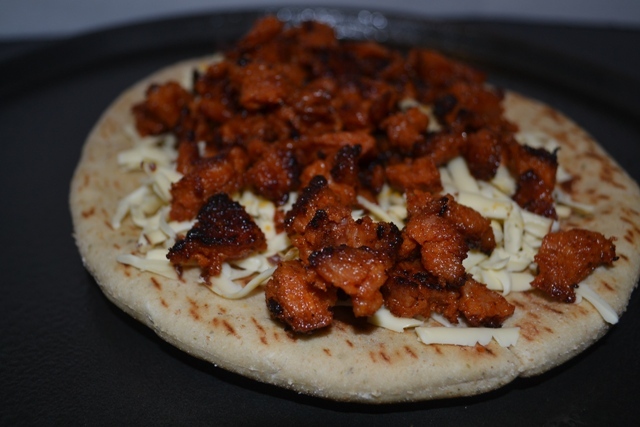 Slice and crumble the Chorizo and cook in a skillet until slightly browned. Place one pita pocket on a greased cookie sheet or pizza round. 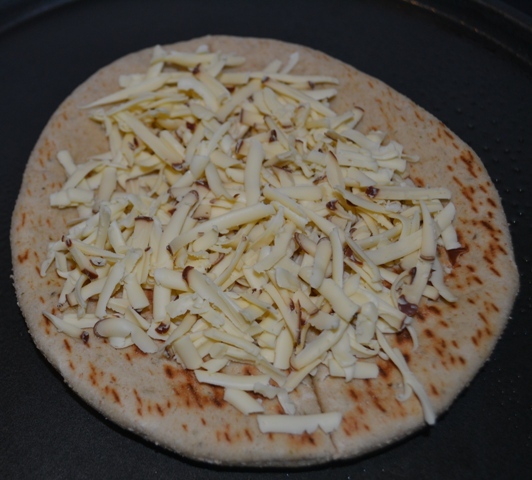 Sprinkle the cheese leaving about a 1/4″ from the edge. 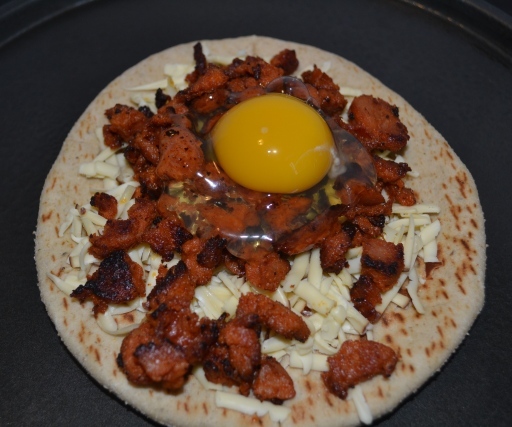 Top the cheese with the pre-cooked Chorizo. Create a small dip in the center (this is to prevent the egg from sliding off) and crack egg onto the top of the pizza. Sprinkle with salt and pepper to taste. Bake in the oven for 9-13 minutes. The egg whites should be solid white while the yolk should still be runny and giggle when you lightly shake the pan. Slice and enjoy. NOTE: The cooking time will vary depending on the pita pocket that you use. 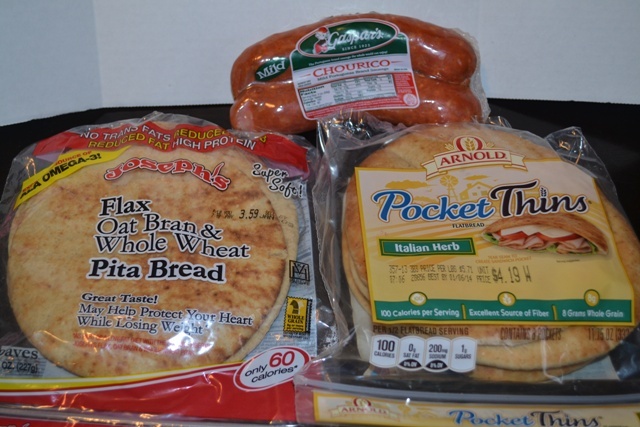 I did make this using Joseph’s Brand Flax Oat Bran and Whole Wheat Pockets (4 Net Carbs per Pita) and Arnold Pocket Thins (15 Net Carbs per 1/2 Pocket) both cooked up the same and tasted great just a matter of preference and saving calories or carbs. 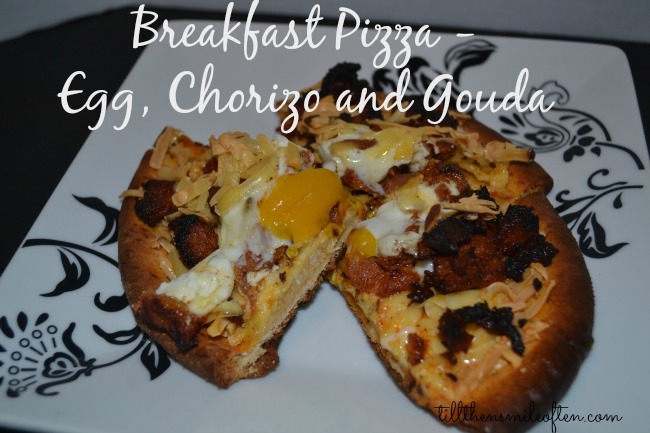 Have you ever had a breakfast pizza? What were your favorite toppings? I also did a Guest Post over at The Homey Owl for Baked Caramel Maple Walnut Apples. Go check it out! girlfran, we are on the same wavelength! i made bfast pizzas last weekend and they were delish! i used an english muffin, lean ham, half hard boiled eggs, a thin slice of tomatoes and topped with a bit of freshly shredded mozzo cheese. YUM!!!!! chorizo is next to be added because i LURVE chorizo! happy new year!! Yours sounds delicious too! Chorizo is so good I could eat it everyday I think! Hope you have a very Happy New Year! mmm this looks so tasty!! cheers to 2014! Thank you, I really enjoyed taste testing this recipe! 😉 Have a Happy New Year! I didn’t try it until a few years ago and it fast became one of my most favorite cheeses! So good! It really does! It is so quick and easy to throw together. I even put one in the fridge to re-heat later. I will let you know how it holds up so it may be even quicker for Ryan to eat and go! Another winner! That looks wonderful! Thank you! I may have had one too many in the taste testing part of this recipe but so glad I did. It was really good. Better than I expected and held up when I reheated it too. Hope you like it. That looks sooo yummy! I’ve never had egg on a pizza, but there’s a local brewery that has a specialty pizza with it and I’ve heard it’s marvelous! 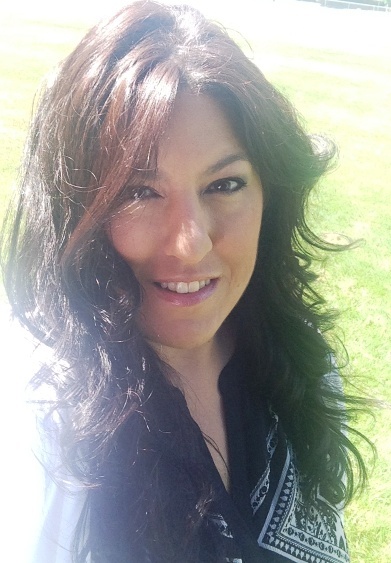 I love chorizo! I had not tried it before either but it was surprisingly good. Chorizo is one of my favorites. This looks fabulous- I would love to start out the day like this- Pinned! Thank you! It was really quick to put together and I made a few and then re-heated one in the microwave and it was still yummy! Perfect grab and go meal. Thank you! It was yummy, I had some re-heated leftovers this morning. Hope you give it a try! It is good. You don’t taste the egg as much as you would eating them plain. Hope you like it! Yum! I agree – any chance to use gouda means a tasty meal! I would definitely make this – sounds delicious! Gouda has to be my most favorite cheese ever! Hope you try it, it was quick to put together and delicious! You had me at chorizo! !